The indicated price refers to the measure of the artificial plant h 160 (supplied with self-standing support base), custom assembled in Italy by master craftsmen. The measures are expressed in cm. The quality of the materials used makes it resemble a real plant, the leaves are inserted on natural trunk. Ideal for indoor environments where there may not be sufficient light or in case one may want a low maintenance item. Available colors: green (see photo). This line of plants is distinct from imported plants that have been mass produced… our plants are assembled and tailor made in Italy by master artisans in our laboratories. Rigorously MADE IN ITALY, artificial leafs of the highest quality are mounted on natural trunks (every single plant is a unique piece, a work of art). Real curated trunks, dried to ensure maximum hygiene to last through time. Every single item will have different shades and details to express the same diversity you would find in natural plants. The leafs used are skillfully assembled to the trunks we’ve selected to best replicate a real, natural plant. The vegetation faithfully reproduce shades of colour, patterns, consistencies and veining and is realized with resistant and easy-to-wash materials. Every single plant will be a unique specimen! Vase to match your plant: except when specified, the decorative vase is never included in the delivery of the plant, our job is in fact to provide you with the most suitable vase depending on the plant of your choice. The plant will however be supplied with a small, weighted, plastic pot to make it free-standing. It will therefore be in your interest, whenever the decorative vase won’t be provided, to choose the most suitable item in the POTS section of our website, or make use of a vase you already own. H PLANT: always refers to the total height from the floor including the weighted support vase (usually in plastic). CUSTOM-MADE PLANTS ON REQUEST: minding the standards of artificial plants you may view on the Website, remember that our strength is to build them according to your needs. 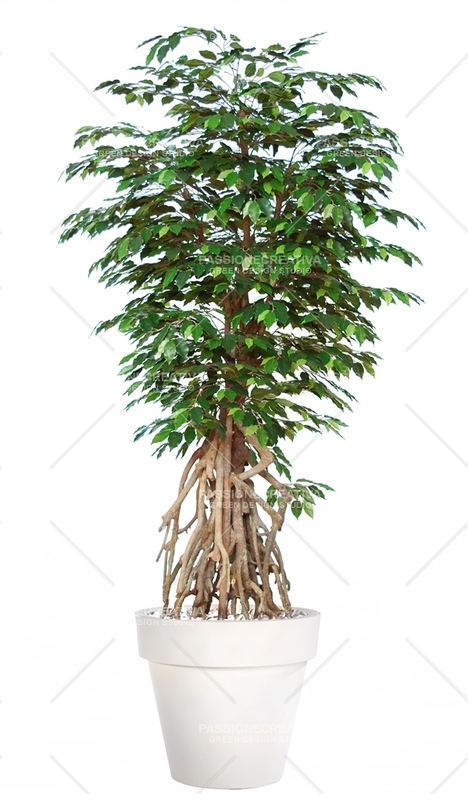 Based on the available foliage and trunks in stock, we are able to create trees up to 12 meters tall (FICUS, PALMS etc...), we can make color variations on the leaves, widen the canopy, decide what height the grafts should be installed at, to give more emphasis to the trunk or to the foliage .... We are able to cater to the most diverse requests for custom made projects: if you have these requirements, we invite you to contact us directly. CLEANING OF ARTIFICIAL PLANTS: we provide on request a specific antistatic cleaning product for the maintenance of the leaves, which gives the foliage brilliance and increases protection from dust. We also provide specific maintenance for businesses and individuals who request it. ARTIFICIAL PLANTS/FLOWERS, WHAT A PASSION: We recreate green settings/scenery wherever natural green would be difficult to develop and maintain ..... due to lack of light or in general for an unsuitable microclimate. We propose to our customers (even the most skeptic ones) the use of these decorative solutions to replace real plants, the regularly fallen leaves of which have to be cleaned, leafs may turn yellow in color, and necessitate pruning of dry branches ..... Those who choose artificial plants over real plants will over time save both time and money on maintenance. Ideal for public spaces, offices, SPA, hotels, companies, private homes ....... our taste and passion for the beautiful can change the whole ambiance !. Thanks to the suggestions of our GREEN DESIGNER we will help you place the plants in the right place and decorate with style the spaces you wish to add a touch of creative green to. DELIVERY TIMES: normally we guarantee the shipment of artificial plants within 24/48 hours for items, which are ready for delivery, and within one week for custom-made seminatural-plants all over the country. For specific supplies please contact us. RETURN OF GOODS: Passionecreativa e-commerce on the WEB since 2008 provides pre/post-sales support for all our affiliated customers in Italy and abroad. Any inconvenience, from shipment to delivery of goods through our couriers under contract, will be tackled and solved securing maximum customer satisfaction. You can contact us directly for any specifications you would like to receive. For almost ten years we have been providing a top-level service by always taking care of every single detail and selecting the most efficient partners on the market. The constant search/selection of quality products around the world and the utmost attention to every single customer, has led to the fact that we have never had a returned item! SATISFIED OR REIMBURSED: we remind you, however, that if you do not like the product you purchased at the time of reception, you have the option to return it in the times and in the procedures described in the RETURN POLICY. For any specific request, please do not hesitate to contact us at our CUSTOMER CARE +39 3805191197.